"Yesterday they fought each other â€“ today they fight together in a dead end canyon called Diablo!" 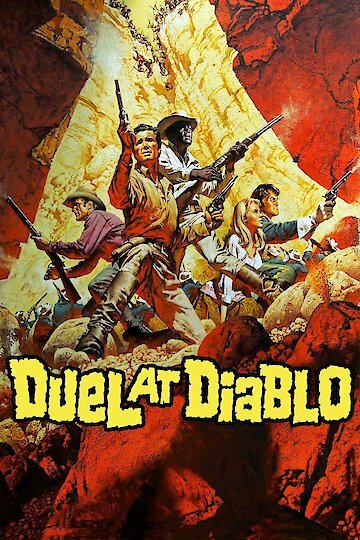 Dual at Diablo is a 1966 western. The cast is headed up by James Garner and Sidney Poitier. The movie also features a large supporting cast that includes Bibi Anderson and Dennis Weaver. The story centers a frontier scout named Jess Remsberg (Garner) who rescues a woman (Andersson) from the Apaches. The woman had been kidnapped two years earlier, When she is returned to her husband the local towns people treat her like an outcast. The movies raises interesting questions about racism and sexism. The other part of the plot is that Jess is tracking people who murdered his wife. Duel at Diablo is currently available to watch and stream, download, buy on demand at Amazon Prime, Amazon, Vudu, Google Play, iTunes, YouTube VOD online.